To best attract and prepare for Chinese outbound tourism, it’s essential to understand when Chinese are most likely to travel. So we’ve prepared a helpful guide to China’s national holiday schedule to help identify peak times and destinations. China’s biggest and most important holiday is Chinese New Year, also known as Spring Festival or Lunar New Year. As it is based on the traditional Chinese lunar calendar, the date changes every year, but it always falls between late January to mid-February. The national holiday period is 7 days, one of two long ‘Golden Week’ holidays for Chinese workers. As Chinese New Year is traditionally a time to reunite with family, this is an especially important week for family travel. According to Forward Keys, outbound travel was up 11% over the Chinese New Year period in 2018, compared to 2017, with close to 7 million trips abroad. Although most travelers spent a week or more abroad during these trips, over three quarters went to destinations in Asia, with Thailand, Japan and Taiwan the top three destinations, although New Zealand had the biggest growth, with a 30% increase in bookings. Looking specifically at high net worth (HNWI) travelers, the Hurun Report’s Chinese Luxury Traveler 2018 report found that 64% of affluent Chinese surveyed planned to travel overseas for Chinese New Year in 2019, with Australia, Thailand and New Zealand the top three destinations. Booking for Chinese New Year travel starts early, and destinations around the globe cater to Chinese communities and visitors during this time, with traditional cultural celebrations as well as commercial activities such as special window displays and promotions. Another major holiday for overseas travel, especially for long-haul trips, is China’s National Day, the second ‘Golden Week’, which starts on October 1 each year. The Mid-Autumn Festival, another one of the most important traditional Chinese holidays, is based on the lunar calendar and is celebrated with one day off. Always around the end of September or beginning of October, Mid-Autumn Festival can sometimes overlap with the National Day holiday, merging into an eight-day holiday. In 2019, however, the two are several weeks apart, with a long weekend in mid-September, followed by a week-long holiday at the start of October. In 2018, 6.94 million Chinese traveled overseas during this time, an 8.2% increase from 2017. Those born after 1995 had the biggest growth rate, with an increase of 120% compared to the previous year, according to Chinese OTA Fliggy. According to OTAs Ctrip and Lvmama, Japan displaced Thailand as the number 1 destination country for Chinese outbound travel during the 2018 National Day holiday. Other top destinations included Southeast Asian countries Thailand, Singapore, Vietnam and Malaysia. 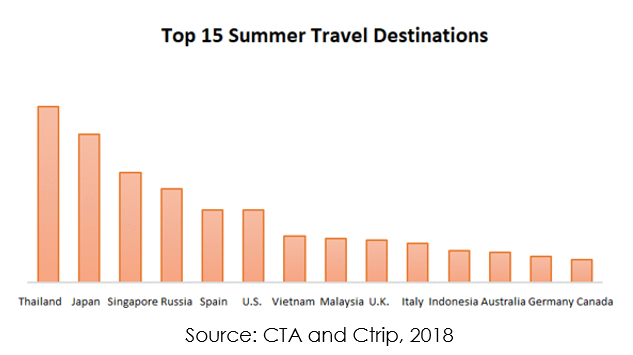 Top long-haul destinations on Ctrip were the US, Canada, Russia, Australia and Italy. Hospitality group Hotelbeds had slightly different results. According to their data, the top 10 international destinations for Chinese travelers during the National Day Holiday were: Thailand: the United States; Japan; Malaysia; Singapore; Indonesia; Philippines; Vietnam; Italy and South Korea. Although Asia is still popular in October, this is also the peak season for longer-haul and less traditional destinations such as Africa and Latin America. International Labor Day, celebrated on May 1st, was once a third Chinese ‘Golden Week’, but it was downgraded to one day off in 2008, when Dragon Boat Festival, Mid-Autumn Festival and Qingming all became additional public holidays. It is now more popular as a domestic travel holiday, though 41% of travelers using OTA Tuniu’s online booking services for the holiday in 2017 did go abroad. 8% of respondents in the 2018 Hurun report indicated that they planned to travel overseas during this time, a slight decrease from the year before. Another lunar holiday, held between late May and mid-June, Dragon Boat Festival is only a one-day holiday for Chinese workers. But, perhaps because of favorable weather conditions at this time of year, it is becoming an increasingly popular time for outbound travel, even to long-haul destinations. There were 2.71 million outbound trips in 2017, up 7.2% year-on-year. According to the CNTA, the most popular destinations in 2017 were Russia, Thailand, Italy, Vietnam and France. This holiday was chosen by only 5% of travelers in the 2017 Hurun Report, and not included in the 2018 report at all. There is no national holiday in the summer, but it is one of the most popular periods for Chinese outbound tourism, with a particular emphasis on family tourism, and graduation tourism and educational tourism for young Chinese. According to data from ForwardKeys and COTRI, Chinese outbound travel bookings for summer 2018 were up 13.5% compared to the year before. It was also the third most popular travel period in both the 2017 and 2018 Hurun Reports, with 17% and 19% of HNWI Chinese planning to travel in the summer, respectively. An estimated 30 million Chinese traveled abroad in July and August 2018, 58% of whom traveled with family. The top 15 overseas destinations were Thailand, Japan, Singapore, Russia, Spain, USA, Vietnam, Malaysia, UK, Italy, Indonesia, Australia, Germany and Canada, with Russia performing especially well because of hosting the World Cup. In 2018, southern hemisphere destinations Australia and New Zealand, as well as Nordic countries, were particularly popular for Chinese travelers trying to escape the summer heat. New Zealand encouraged summer travel particularly well in their 2018 WeChat marketing, with a number of posts about both family travel and winter activities. Held on April 4 or 5, Qingming is also known as the Tomb Sweeping Festival, a time to return to one’s hometown to pay respects to ancestors. Because of this, and because it is another one-day holiday (celebrated, like the others, with a three-day weekend), Qingming is primarily a time for domestic travel. According to the Chinese Ministry of Culture and Tourism, there were 100 million domestic trips during the 2018 Qingming holiday in China. The Western New Year is also celebrated in China, with a national holiday on January 1st. This is usually celebrated with family at home, and with Chinese New Year so close, it is not a popular holiday for travel. This largely depends on the climate. Warmer and island destinations are popular during the cold months of Chinese New Year, although there is interest in colder destinations for winter tourism – including skiing tourismand Christmas tourism – as well, while cold climate Russia is popular during the summer months. Knowing when Chinese tourists visit your destination can be of great help, as well as knowing what different activities they engage in during different times of the year. Long-haul travels are concentrated around the seven-day holidays of Chinese New Year and National Day, as well as the summer months, when students have two months off school. Southeast Asian trips are popular destinations for long weekends. The length of the trip will also have an impact on the number of activities and locations visited, with more opportunities to promote and develop regional or more off the beaten track destinations. Chinese New Year is about family unity, so this time of year sees many extended families traveling together, having different implications for the services needed. During the summer months. Parents take their children traveling, while retirees mainly travel during the off-season when traveling is cheaper. It is harder to predict when wealthy Chinese travelers will go overseas, as 48% of respondents in the Hurun Report’s 2018 survey said they did not have a fixed time to travel. In the past, Chinese tourists tended to book their outbound travel very early, but this is decreasing significantly as Chinese travelers become more experienced and many countries have relaxed visa restrictions, either offering visas on arrival or waiving visas altogether. Because of this, booking times are getting shorter and shorter, with a 2018 survey revealing that over 40% of outbound travelers surveyed booked their flight tickets only two weeks before the trip. However, bookings to expensive and remote destinations – especially those that still require a visa – will still be longer than this, and the inspiration and planning phase of a trip can start well before tickets and accommodation are actually booked, meaning that destinations outside of Asia should still think about their marketing several months before a major holiday period. The correct timing of your promotional activities can truly impact their success. Travel brands are advised to start running holiday-period promotions around one to two months in advance. Festivities present a great opportunity to send holiday greetings and engage with your fans and followers. Running a red packet campaign for Chinese New Year is a good way to show Chinese consumers that you care, and to stand out in their minds.